Will offering charge up the market? Would you buy stock -- or a car -- from this man? 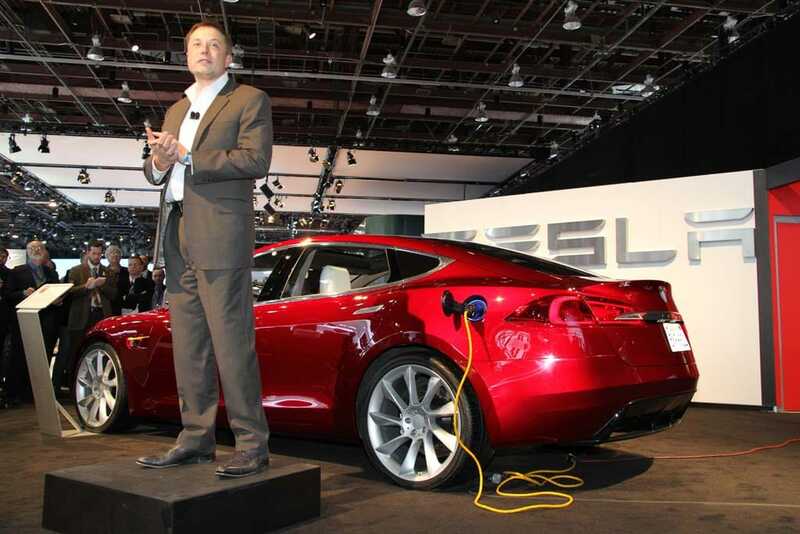 Tesla CEO Elon Musk at the unveiling of the maker's Model S battery car prototype. Investors will have the chance to plug into the nascent electric vehicle market tomorrow when Tesla Motors launches its much-anticipated Initial Public Offering. How the company will fare with the market remains to be seen. On the one hand, Tesla is an early entrant into a market segment most experts anticipate will grow rapidly over the coming decades. On the other hand, the California-based maker has been losing money since it was founded and expects to continue to do so for at least several more years while it prepares its first mainstream battery car offering. Stay Charged Up With a Free Subscription! Tesla’s move to go public is the first IPO by a U.S. automaker in half a century, though observers say a string of additional electric vehicle manufacturers could make moves into the market if Tesla’s bid proves successful. Based in Silicon Valley, Tesla was founded in 2003 by Elon Musk, a South African émigré who made his initial fortune as one of the founders of the online service PayPal. He has since moved into a variety of other high-tech ventures, including SpaceX, which hopes to become one of the leading providers of commercial space launches. In an interview with TheDetroitBureau.com, Musk said his interest in electric vehicles dates back to high school days, and he expressed his commitment to put every penny at his disposal into the project. Apparently, he meant it, as he recently conceded in a court filing that he has burned through his personal fortune. But such a scenario, he insisted, during that interview, “won’t change my lifestyle one bit.” Nor, it seems, Tesla’s ambitious goals. Two years ago, the company launched its first product, a $109,000 two-seat sports car, the Tesla Roadster. Production of that model, which is based on a platform designed by Britain’s Lotus, is expected to soon wind down. That will leave Tesla without any new product to sell until sometime in 2012, when it is expected to introduce the Model S, a planned 7-seat sedan. Also designed to run on lithium-ion batteries, the Model S is set to be assembled at the old NUMMI plant, in Fremont, California, that had previously been operated as a joint venture between Toyota and General Motors. GM abandoned the operation following its 2009 bankruptcy and Toyota later decided to close the assembly plant entirely. The Japanese maker now plans to transfer the NUMMI plant to Tesla – and will take a $50 million stake under the IPO. The California firm has also received a $465 million loan from the Department of Energy to help fund the development of the Model S and subsequent models. Musk himself has reportedly spent at least $70 million of his own on Tesla, while recruiting many of his allies in Silicon Valley to pump in their own money to prop up the start-up. Musk said he expects the sedan to be sold for less than $60,000, reflecting the anticipated reduction in costs for electric vehicle technology – starting with the batteries. A recent study by Boston Consulting suggested that while lithium-ion technology currently costs about $1,000 per kilowatt hour, it could dip to less than $400 by decade’s end. Other analysts, however, warn that the price needs to drop closer to $200 per kWh before electric propulsion becomes truly competitive with conventional gasoline power. But that equation could change if, as most expect, petroleum prices continue to rise. And there’s growing support for electric propulsion from lawmakers around the world, notably including the Obama Administration, which last year authorized the spending of $2 billion to help develop more advanced batteries and a U.S. production base. Nearly two decades ago, industry leaders actively resisted efforts by the State of California to create a battery vehicle market. But these days, there’s growing support for the technology, even if there’s no clear answer as to how much of a market there’ll be for battery cars – or how soon. Recently-retired General Motors Vice Chairman Bob Lutz predicted plug-in hybrids and pure battery-electric vehicles would account for perhaps 5% of the market by decade’s end. Nissan CEO Carlos Ghosn thinks the number will be double that. The fact that Nissan claims to already have 20,000 orders on hand for its Leaf battery car is seen as an encouraging sign. Whether Tesla can take advantage of the potential battery car boom remains to be seen, however. The company is hemorrhaging cash, analysts note, having lost money in every quarter since its founding – a total of $230.5 million so far. And with Model S development efforts underway, the loss for the first quarter of 2010 jumped to $29.5 million, nearly double the year-earlier figure. But Tesla does have other potential sources of revenue while it waits for the Model S to charge into the market. It is providing the battery technology for Daimler AG’s new Smart electric, a battery version of the 2-seat fortwo microcar. And Tesla is working with Daimler on other battery-based vehicles. Meanwhile the California firm has hinted that it may cooperate with Toyota on some of that maker’s battery car efforts. Though Toyota produces the world’s best-selling hybrid, the Prius, some observers believe it is lagging behind the competition on more advanced battery car technologies, and could use help moving ahead. How investors will balance these factors will be tested when the maker launches its new IPO. Tesla hopes to sell 11.1 million shares of stock, equal to 12% of the company, at a price range of $14 to $16.